Outfits with Striped Sweater. Who doesn’t own a pair of striped sweater? Be it men or women both will definitely have at least one of it in their closet. The greatest thing about striped sweaters is that they are forever, they never run out of fashion. Along with being very common and easy to purchase, the striped sweaters can be worn in multiple ways from smart casual to formal events. 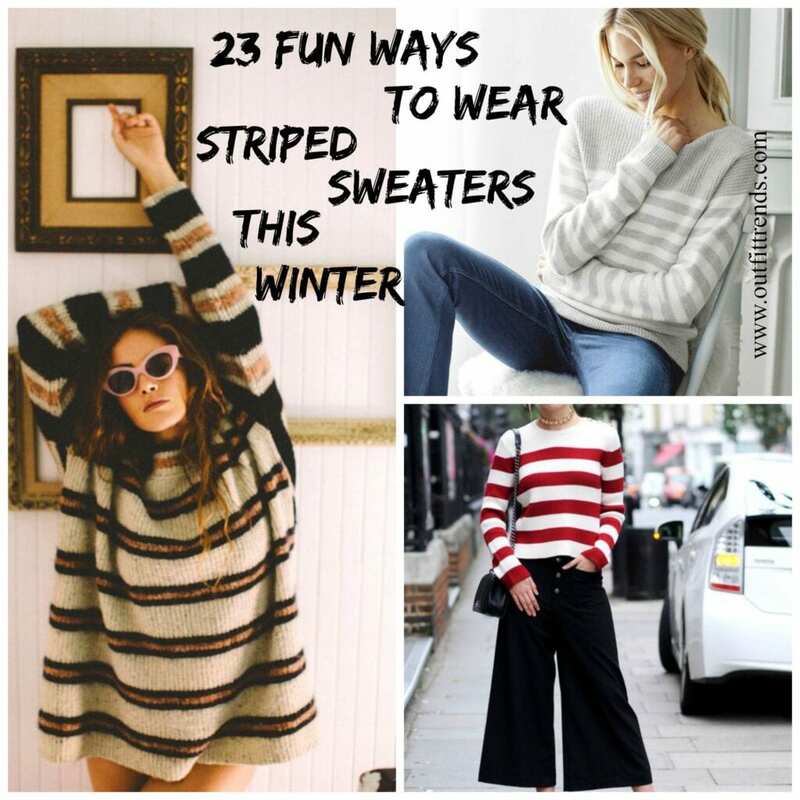 To help you out dress in multiple ways and look fresh each time we have 23 ways you can wear striped sweaters this winter. Wear your striped sweaters with jeans and sneakers for a casual street style look. Add some funky accessories to bring colors in the dull winter outfits. Mix and match prints, patterns and stripes for a cool day time look. Do keep accessories minimalist when wearing striped sweaters during day time. For the Fall season, wear striped sweaters with shorts or skirts, leather ones will be ideal if you’re looking for party wear. To carry a striped sweater for a casual everyday look, wear an elbow patch stripe sweater as a top with any sort of pants that you are comfortable in. You can add a simple pendant and carry your hair in a top knot along a black clutch to look effortlessly classy. You don’t have to wear similar colors all the time, instead you can experiment with your winter look. Wear a neutral color striped sweater and combine it with a red or any other bold color skirt and footwear. This is ideal for outings as it gives a very refreshing look to your persona. A lot of women complain that wearing sweaters over pants give them very casual and laid back look. Well ladies, we have got the perfect solution to your worry. Just pair up your favorite striped sweater with any matching colored button skirt and there you have the perfect feminine touch to your attire. One of the biggest challenges that women face is to decide which footwear to opt for with sweater and winter dresses. Well, the easiest and most stylish way is to wear long boots with the outfit. The entire winter attire will look absolutely flawless. A fun way to got about stripes is that you can dress in stripes from head to toe. Wear a half sleeves striped sweater and combine it with a striped slit skirt. This outfit is perfect if you are running errands or hitting the streets for fun. You can wear either boots or sneakers depending upon where you are headed to. Simple striped sweaters can be very monotonous and give you similar look even if you style them quite often, that’s why go for a multi-colored striped sweater. You can wear it over any colored dress or combine it with a skirt, ankle boots and there you go, looking all radiant and stylish. Feeling much cold, but want your style on point? Well simply wear a striped high-neck sweater and combine it with your favorite pair of ripped denim. In addition, you can wear some statement rings to look elegantly styled. Another fun way to go about your striped sweater is that you can wear it with a high-waist pants. You can tuck in the sweater. This look adds a lot of charm as well as gives you a strong look. Too add more warmth and style to your striped sweater wear it with a denim skirt and wear a leather trench coat over it. Adding multiple layers will make the outfit fun to wear. You can wear lace boots to compliment the whole look. We all agree that adding leather to the outfit makes it automatically hot and stylish. You can wear a leather skirt or leather pants with a black and white striped sweater, to make the look more pleasing wear sneakers and you are set to head out! Instead of wearing a heavy striped sweater you can always wear striped sweater which have broad or lesser stripes and combine it with pants of the complimenting shade from the stripes. Easy and effortless look to flaunt wherever you go! Want a more playful and jolly look? Well, wear a rainbow striped sweater with denim pants. This is very ideal for school/ college going girls. Some days you might just want to go simple and rather wear soft colors, so go for a simple white or beige cashmere striped sweater, wear your hair in a low ponytail and you are good to go! For all the working ladies we don’t want to disappoint you! You can wear your striped sweater with skinny pants and your favorite flat pumps. You can play with your hair either keep them loose or tie them, whatever your mood is!